Modern culture is one where innocent lives are extinguished daily, and where the elderly and those with disabilities are often overlooked and neglected. Consequently, now more than ever, pro-life supporters must reach out to those who might not share one’s faith, or might even look different, to create a commonly held vision of what it means to respect life and the dignity of human life. That was the message of Louisiana Black Catholics for Life director Dr. Kathy Allen, the keynote speaker at the Every Life: Cherished, Chosen, Sent conference on Oct. 6 at the Bishop Tracy Center in Baton Rouge. 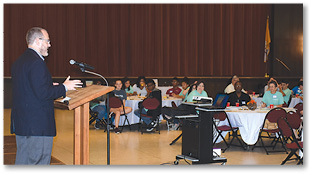 The conference was hosted by the Office of Marriage and Family Life of the Diocese of Baton Rouge. The morning conference also featured Louisiana Conference of Catholic Bishops director Rob Tasman speaking on faith and public policy and Danielle Van Haute, director of the diocese’s pro-life program, speaking on contraception. Monice Oliphant, director of religious education at St. Isidore the Farmer Church in Baker, brought a group of more than 20 high school students to attend, partly to help them in their preparation for confirmation. Allen, who admitted she had an abortion while she was a student at Michigan State University, said pro-life supporters must actively work for a greater commitment to justice and peace. She said too often many are so wrapped up in their own lives, worried about their homes, their money or other exterior distractions, that they have little time to be concerned with the homeless or the less fortunate. “Too often we have an individualist view; my car, my joy, my group of friends,” she said, adding that is how many determine the value of their own lives. But a eucharistic lifestyle is one of solidarity and rooted in grace. She said that a greater union with God helps individuals to become vibrant members of their community, and to give their gifts and talents to the community. Allen explained that choosing life means surrendering one’s duties, responsibilities, anxiety and fears to God and get their priorities in line with what God desires. “Pro-life means choosing Christ,” Allen said. She cited statistics showing that 60 percent of abortions in Louisiana were performed on African-American women. She noted that there are more than 9,000 abortions performed annually in the state, with East Baton Rouge and West Baton Rouge parishes combining for more than 1,500 of those procedures. Activism was also the theme of Tasman’s talk. He encouraged all in attendance, especially the young people, to participate in the political process. He also encouraged everyone to speak out for the needy, and for those who might not have a voice, especially the unborn. But when advocating on any issue, Tasman strongly urged individuals to be Catholic first. Van Haute discussed how when hormonal contraception was developed in the 1960s, it was going to change everything. She noted that at the time a fear of massive, worldwide famine existed because of the expanding world population, and that contraception would help curb that growth. She said there are several methods, such as Natural Family Planning, that are as effective as hormonal contraception. She also discredited the common perception that contraception helps reduce abortion rates. Statistics show that 54 percent of women seeking abortions are using contraceptives. She also challenged the widespread belief that hormonal contraception addresses reproductive problems. She said the pill treats symptoms but the healthier process is to identify the health problem and treat it.